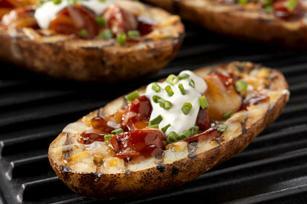 Here's a tasty take on a restaurant favorite: loaded potato skins. These are brushed with garlic butter and filled with grilled hot dogs and BBQ sauce. Cut potatoes lengthwise in half; scoop out centers, leaving 1/2-inch-thick shells. Discard removed centers or reserve for another use. Mix butter and garlic until blended; brush onto insides and outsides of potato shells. Grill potatoes and franks 7 to 9 min. or until potatoes are crisp and franks are heated through, turning potatoes after 4 min. and turning franks occasionally. Slice franks; spoon into potato shells. Drizzle with barbecue sauce; top with cheese. Grill 1 to 2 min. or until cheese is melted. Top with sour cream and chives. Instead of grilling the buttered potato shells, you can bake them in a 250ºF oven 15 min. or until crisp. While potatoes are baking, cook franks as directed on package. Slice franks, then fill potato shells as directed. Bake 5 min. or until cheese is melted. Cool, then refrigerate the removed potato centers. When ready to use, reheat the potatoes, then mash with butter and warm milk. Serve as a side with your favorite cooked meat.